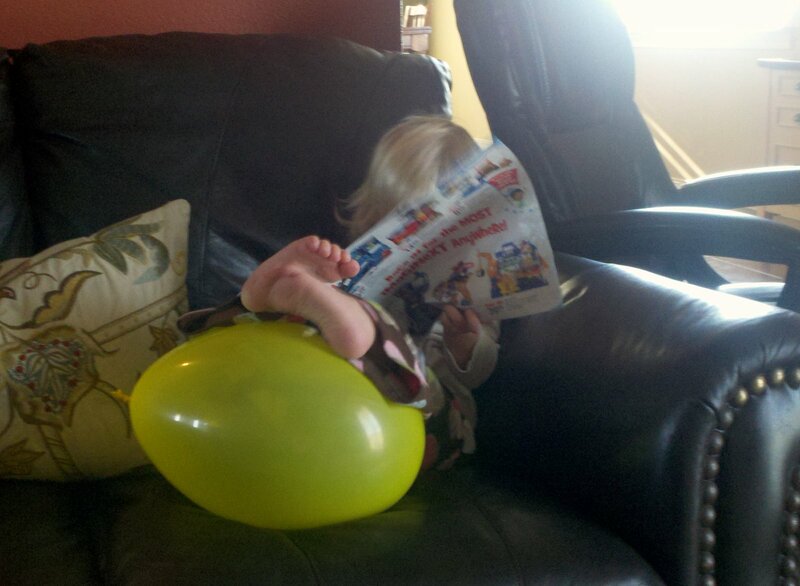 "the great big toys r us book"
when did she get SO BIG!?!? thursday night we went to the iona elementary halloween carnival. the kids came home with some "spooky eyes". the highlight of their night! madalyn loves to just keep hers around her neck (like a necklace) and most of the time i have forgotten they are on her. 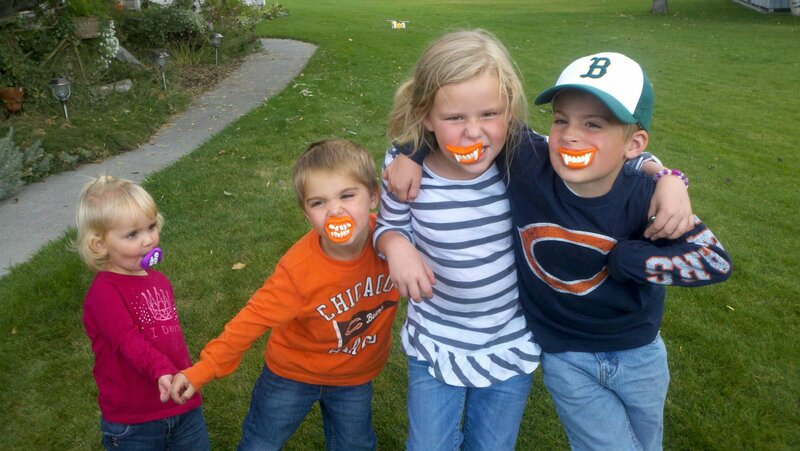 she loves to put them on at random moments and try to "scare" people. she says "arrr..i'm pirate!" today i went to check on her during her nap and this is how i found her! how can you NOT smile! 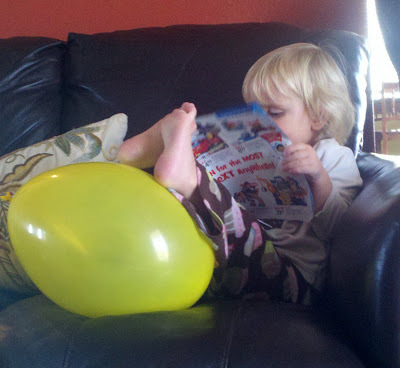 we received "the great big toys r us book" in the mail this week. the kids have carried this book all over the place. they have circled, crossed out, and ripped out pictures. they LOVE when this book shows up! 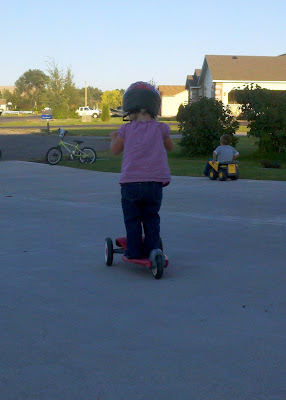 madalyn got comfortable with it the other day and went to work marking and ripping it up. i can't decide what's funnier! 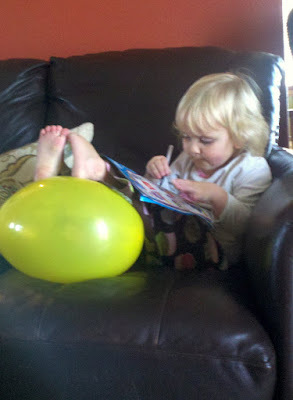 that a 2-year old is marking up her wish list in a magazine or that she is using a balloon as an ottoman! love this girl. i have a closet, close to our living room, that we keep full of blankets. it proves to be handy when we want to be comfy during a movie or warm up. the kids LOVE to take EVERY.SINGLE.BLANKET out to build forts, tall towers, or just a soft place to play. the other day I pulled all the blankets out to meticulously fold them and put them away and i didn't turn my back for more than five minutes and madalyn had pulled them all out and made herself a big bed. it makes me crazy i tell you! BUT, i was so exhausted i just decided to snuggle in next to her and enjoy her creation. i celebrated my 33rd birthday over the weekend. it's hard to believe that i'm nearing my mid-thirties. i still see myself as being 25. oh well. age is just a number. kevin took the day off work and treated me to a fantastic day. 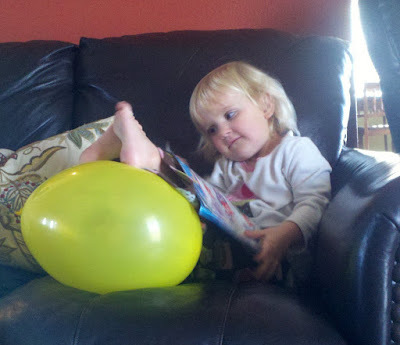 madalyn was so excited to wake up to balloons and presents. she was convinced it was her birthday. the boys kept telling her it was mommy's birthday but she didn't believe them until dad told her. AND THEN...came the tears. opening the miniature presents the boys taped up for me. a rock and a very small piece of paper. my new comfy outfit from kevin. after breakfast and presents we layed around and watched a movie in bed. it was great to not have to be anywhere and just relax together. we went out and grabbed jimmy johns for lunch and drove to a park to eat it. the sun was shining but the wind was blowing so we didn't stay too long. then it was back home for more relaxing until dinner time. then our neighbor, morgan, came and watched the kids while kev and i met up at texas roadhouse with my brothers and their wives for some dinner. after dinner we came home and enjoyed cake and icecream with everyone. i just received my seventh blurb book! i love blogging. it is such an easy way to share pictures and document fun little tidbits about life. But, it's even better when you get those pictures and tidbits in print. as i was reading through this book i couldn't believe that i had already forgotten some of these stories from the last half of last year. so thankful i typed them out! we decided it was time for madalyn to be in a big girl bed. 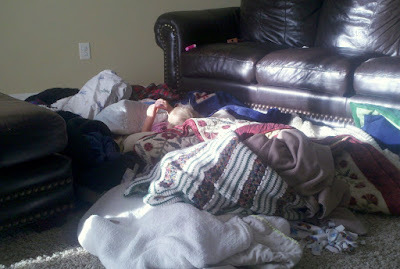 so, last sunday we converted her crib into a day bed. 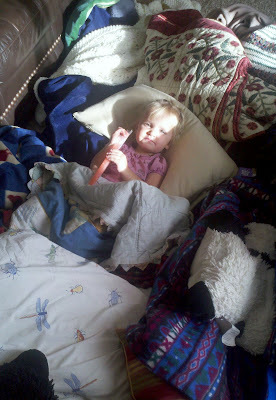 madalyn was SO EXCITED to have a big girl bed and to be able to get in and out of it herself. 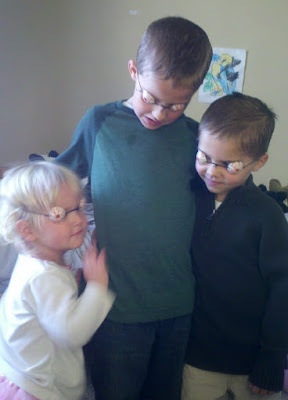 she also thought it was pretty great that her brothers could climb into bed with her. first thing she did after it was ready was put all her babies to sleep in her bed. what a good little mommy! (: and the BEST NEWS: she has never once snuck out of bed during naps or bedtime. so obedient! her only request each night as we leave her room (she says while shaking her finger) "don't.shut.that.door!" and sometimes she will sneak that little phrase into her bedtime prayers. my sister, katie, came to play for a couple days last weekend. it was so fun to have her and some of her girls around. owen and gabby are only 5 days apart and have always had a special little bond. 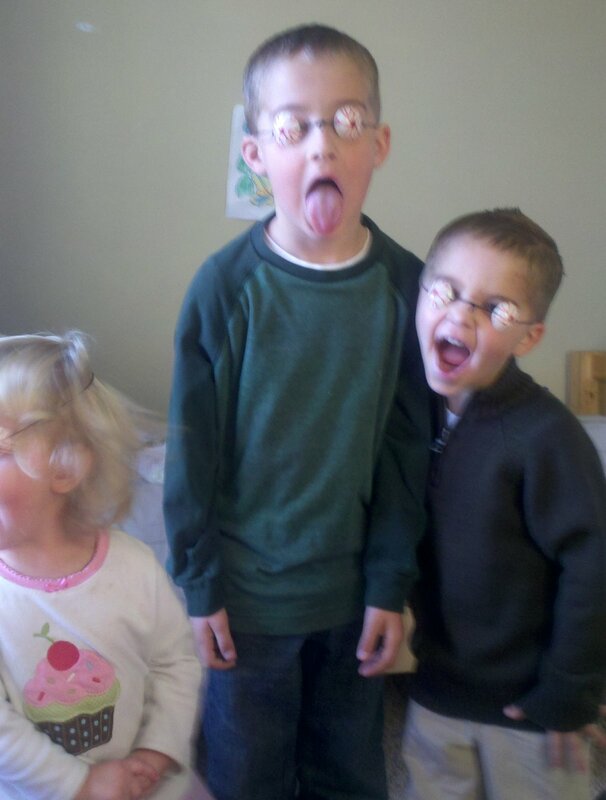 they really had a lot of fun spending the weekend together. 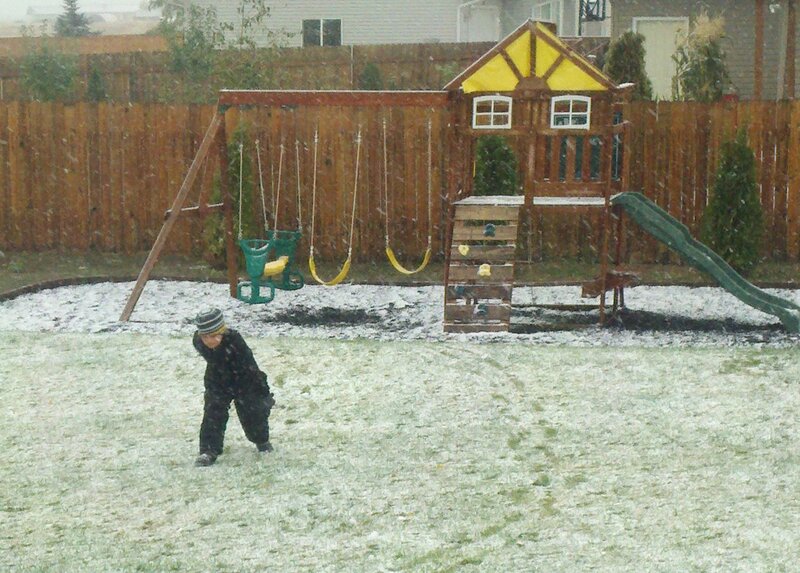 on october 6th we had our first snow fall. 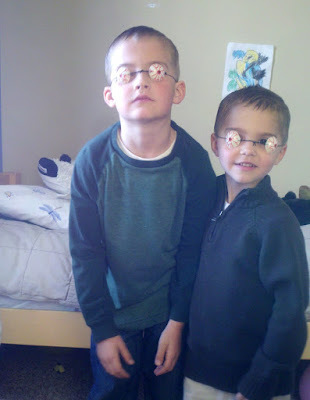 the boys didn't have school that thursday or friday so as soon as they saw the snow fly they were digging through the snow clothes and running to the neighbors. they really enjoyed it! the flakes were HUGE and the snow was super wet and packed really well. kevin called me about four times that day to ask if the boys were having fun in the snow and to check on how much it was snowing. he is like a child when it comes to playing in this white stuff. in fact, he was home about two hours earlier than usual that night...and the first thing he did was put on his snow clothes and went out to build something in the snow. 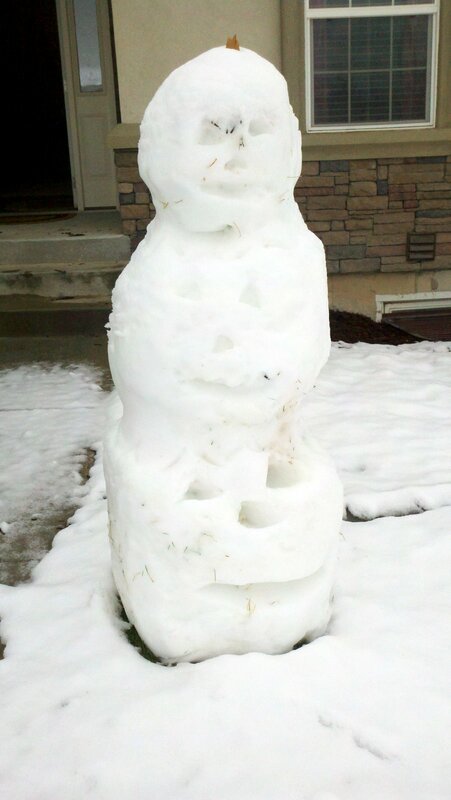 we decided that rather than a snowman it would be more appropriate to build three little jack-o-lanterns. 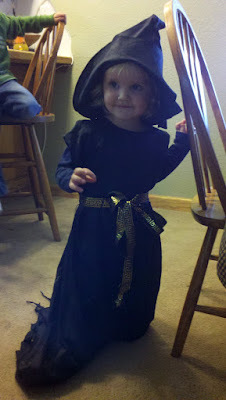 we were at grandma manwaring's house when she was decorating for halloween and found an old witch costume. what a sweet little witch! madalyn LOVES to chase around with the boys. 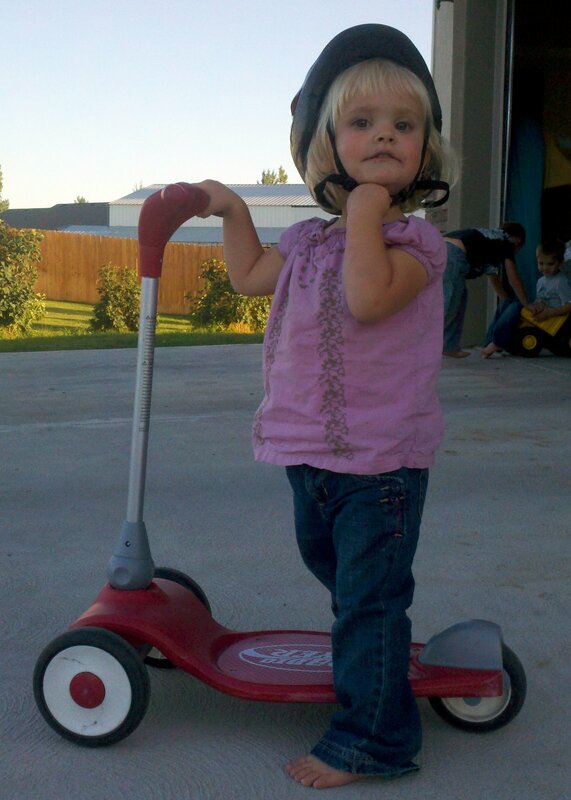 she thinks she is such a big girl. and she is actually starting to look like a big girl. when did she get go big?